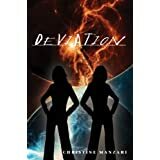 Deviation by Christine Manzari is the first in an independently published YA dystopian trilogy. In Manzari’s world, following a devastating terrorist attack the US government set up the Sophisticates program of human genetic engineering to produce smarter, faster, better soldiers in the war on terror. The Sophisticates are divided into two groups, the Vanguard who are the intellectual ones, groomed to be the country’s next leaders and the Mandates who are those designed to be physically strong. We follow the story of teenager Cleo, who is the product of such engineering as she learns more about the truth of her conception. I really enjoyed this novel. I felt it was well written with an interesting protagonist, intriguing setting and good character development. Good concept well executed. The basic concept of the genetic engineering was very well done and interesting. There was the added interest of Cleo’s special abilities and what that means for her. I look forward to seeing where Manzari goes with this in future books. Nerds vs jocks. It was an interesting take that our protagonist who was raised as a Vanguard suddenly finds herself in a school for Mandates. There is some fun exploration of a fish out of water nerd in a jock environment. Twist at the end. I really didn’t see this coming and, with the amount of YA novels I read and my familiarity with the tropes, that’s not easy to do. Yet it was well within the scope and concept of the world that Manzari has developed – no deus ex machinae here. Nicely done. Pacing. We learn more about the Program and its secrets as Cleo does. The narrative kept me turning the pages, and I look forward to reading more. Interesting themes not fully explored. There were a couple of themes that would have loved so have seen developed further. Some of these include the reaction of non-Sophisticate people who find themselves pushed out of leadership and other prime positions in favour of the Sophisticates. I would also like to have read more of Cleo’s attempt to deal with the fact that she has never known her parents and her attempts to find out more about them. However, as this is the first in a trilogy, I’m prepared to give Manzari a pass on this in the expectation that these will be explored further in subsequent books. As soon as I finished Deviation I immediately went ahead and downloaded book two, Conviction, to my Kindle, which is a good indication of how much I enjoyed this book. I gave Deviation four and a half stars out of five. 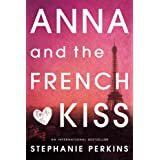 Anna and the French Kiss by Stephanie Perkins is the first in a loose trilogy of contemporary, cutesy young adult romance novels. It is followed by Lola and the Boy Next Door and Isla and the Happily Ever After. It tells the story of Anna Oliphant who is spending a year studying in Paris at the fictional School of America in Paris. She makes friends and has a romance with Etienne St Claire a young Londoner also studying at the school. The setting. I adored the setting. The school sounded fantastic and I loved Anna’s and Etienne’s strolls through Paris. I’ve only spent a couple of days in Paris myself, and I would have liked to have spent more. Perkins really brought out the sense of the city in her writing. The character development. I loved seeing how Anna grew in self confidence during her stay in Paris. The Anna at the end is a very different person from the one who spent her first evening in the school crying into her pillow with homesickness. I also felt that the development was earned. Her experiences in Paris and the friends she makes there allow for such a progression to be possible. The cutesy romance moments. These were squealably cute. The romantic development itself. I know that is kind of contrary to my last comment, but let me explain. I loved the cute date moments Anna and Etienne spent together, but I felt that they were their own worst enemies in terms of their romance. All their problems came from their own actions and lack of communication. I felt if they’d sat down at the beginning and really communicated, there would have been nothing coming between them, which really frustrated me. All too often I wanted to bang their heads together. I did enjoy Anna and the French Kiss, but I didn’t adore it as much as many reviewers seem to have done. I will read the other two in the series at some point, though not immediately. I gave Anna and the French Kiss four stars out of five. 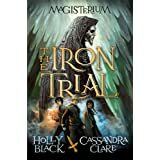 In my recent reading roundup I mentioned that I felt The Iron Trial by Cassandra Clare and Holly Black is a poor man’s Harry Potter. I stand by that opinion. It is almost impossible to read The Iron Trial without comparing it to Rowling’s masterpiece. Let us review; a young infant born towards the end of a magical war is the sole survivor of a massacre which leaves him motherless and with a physical mark of the attack. There may or may not be some shenanigans involving souls. This massacre is the prelude to a decade of truce. Eleven or twelve years later, the young boy starts to attend magic school where he becomes best friends with a boy and girl, and makes an enemy of another rich and arrogant student. He is taught by a kindly if eccentric Master and they have lots of adventures. The one with the power to defeat the enemy has been revealed to the wizarding world. There is a confrontation at the end, and it seems the enemy may not be as dormant as he seemed. Heck, the story even closes with the protagonist in the infirmary having a heart to heart with said eccentric professor and being showered with goodies by his grateful classmates. Does that sound familiar? It could apply to both Harry Potter and the Philosopher’s Stone and The Iron Trial. The parallels are too obvious not be deliberate. What is interesting though are the differences. First of all, the protagonist in the Iron Trial, Callum Hunt, is aware of magic before his entry into the school and, unlike Harry, has to be dragged there kicking and screaming. This means that we lose the sense of wonder and excitement that Harry feels on his discovery of the wizarding world which is a significant part of the charm of Philosopher’s Stone. Secondly, the two protagonists are very, very different. Harry Potter is decency and courage personified (a true Gryffindor). One of his first acts on entering school is to defend a fellow student from bullying. He is direct and open hearted. He typifies the theme of the series which is about doing what is right as opposed to doing what is easy. Callum, on the other hand, is a little more complex. He is less open and trusting and far less inclined to act. He seems to consider the consequences before acting and frequently has to be prodded into doing so. On the other hand, he is less impetuous than Harry and is more likely to look at the bigger picture. He is also much more capable of focusing on the task at hand without being distracted. These changes obviously impact on the way the protagonists relate to their friends and mentors. Callum is less of a leader in his trio than Harry is in his. There is a significant power shift in his relationship with Master Rufus compared to Harry’s with Dumbledore. Dumbledore is the archetype of the wise old mentor and Harry is often left frustrated that he has not been given the answers he was seeking. In comparison, Callum is the one in possession of information which he must choose to share with his mentor, or not as the case may be. Complex protagonist. I found Callum as a protagonist interesting. I appreciated that, unlike Harry, he doesn’t just see things as black or white, there are shades of grey involved. The same is true of other characters, too. I enjoyed the way this impacted their relationships. It was interesting to see what Ron Weasley might have become in different circumstances though the Aaron character. Pacing. I thought Clare and Black kept the story moving along briskly and kept me reading. Chapter art. Each chapter is headed by an image encapsulating what is going on in the chapter. These were gorgeous. Harry Potter comparison. This book is no Harry Potter. It’s missing Rowling’s warmth, humour and imagination. Despite suffering in comparison to Harry Potter, I did actually enjoy this book. I was interested in Callum’s story and will probably continue to follow it in future books. I gave The Iron Trial four stars out of five. 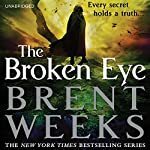 The Broken Eye by Brent Weeks is the third and penultimate in his Lightbringer series following on from The Black Prism and The Blinding Knife. It continues the story of Prism Gavin Guile and his illegitimate son Kip and their attempt to stop the Seven Satrapies from collapsing under the pressure of the Color Prince and his new gods. My impression of this book was that it was very much a middle book – concentrating more on positioning the characters for the final assault. It concentrated more on character development than moving the plot forward. While there were a couple of eyebrow raising moments for me, but nothing compared to the couple of WTF?!? moments of the previous books. That’s not to say I didn’t enjoy it. The magic system. For this series Weeks has created a wonderfully developed magic system. I usually consider Brandon Sanderson the master of magic system development, but with this colour-based system Weeks could give him a run for his money. In essence, Weeks’ magic system works in the opposite manner to a candle. A candle takes a physical substance – wax – and converts it into light. Weeks’ magic users (drafters) can take light and convert it into a physical substance, luxin. Different drafters can convert different colours of the spectrum, red, green, ultraviolet etc – and each colour of luxin so produced has different properties. Like any good magic system, it has clear limitations. Drafters need to be able to see the colour they draft. In Weeks’ world, you can cripple a drafter by limiting his or her access to that colour. Additionally, it is believed that drafters can only draft a finite amount of luxin in their lives before they “break the halo” and become dangerously emotionally unstable. This means they must give serious thought before using their magic. Although drafters can create luxin, that luxin subject to normal physical laws. More skillfully drafted luxin is stronger and more stable, but lack of skill can be compensated for by amount of luxin drafted. The character development. There is some great character development in this book. Without going into spoiler territory, Kip, Karris and Teia are all becoming the people it looks as though they will need to be for the final book. On the other hand, Gavin’s character arc has hit rock bottom. In a standard fantasy, that would mean that his fate is going to take a large upswing. However, this is a Brent Weeks series we’re talking about here; anything thing could happen. Setup for final book. It’s actually really clever that we’re three books into a four book series and Weeks could still go anywhere with his storyline. That makes it wonderful for speculation. The narration. The audiobooks of The Blinding Knife and The Broken Eye were narrated by Simon Vance. The combination of Weeks’ witty writing style and Vance’s narration is pure gold. I just ADORED the narration. In fact, Vance’s narration of book two, The Blinding Knife, was a major factor in my becoming so hooked on audiobooks. If you’re thinking of checking out this way of enjoying books, you could do a heck of a lot worse than Vance and Weeks. Spot the antagonist. A fantasy series needs a strong villain, and we saw very little of the Color Prince in this volume. I’m going out on a limb here and assuming the Color Prince is the series’ big bad. That’s by no means certain when you’re talking about a Brent Weeks series. The antagonist role in The Broken Eye was played by Andross Guile and for Teia Murder Sharp. Don’t get me wrong; they’re both nasty pieces of work, but they both operate primarily on the mundane plane. When you’re getting into territory of new gods being born, you need an antagonist operating in the same sphere. In some cases it could also be said that the characters’ biggest challenge was their own emotional baggage. That is fascinating in terms of character development, but less so to create dramatic tension. In summary then, I would recommend the Lightbringer series – especially in audiobook format. I gave this particular volume, The Broken Eye, four stars out of five.